Walking at night is a wonderful experience, particularly if there’s a full moon. The landscape takes on a very different context and what was once familiar becomes unknown again. 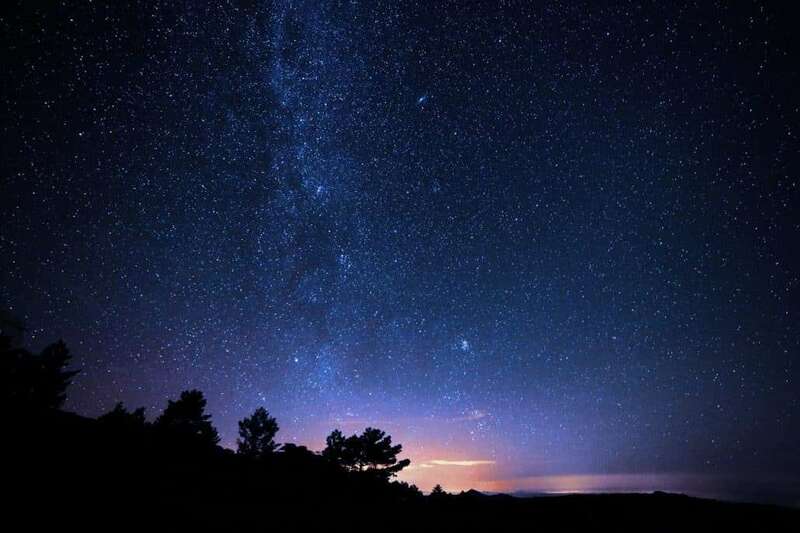 To fully enjoy walking at night though you need to be able to navigate at night, and navigate well; marshes, edges, streams and other features may not be visible until you’ve sunk in, fallen off or fell in them. On a less romantic note, the ability to navigate at night can also save you from making navigational errors in poor visibility. In this blog, we introduce you to some of the skills needed to navigate at night. As always, please feel free to read the whole blog or to skip to the relevant section. It goes without saying that if you’re going to be practicing these techniques them practice them somewhere that you can get home safely from – you don’t want to be calling out the mountain rescue. Night time navigation, or in fact any type of navigation must begin with preparation. Aside from the obvious map and compass this preparation must also include a headtorch and spare batteries, and you know where they say the best place is to store spare batteries? In a spare headtorch. It should really go without saying that you must also bring the standard kit – warm clothes, waterproofs, emergency bivvy bag, whistle, water, spare clothes, etc. Obviously, bring a compass. But it’s worth investing in one with a luminous dial, this will make picking out accurate bearings that much easier. The Silva Expedition 4 is an affordable compass from a trusted brand that boasts this feature. They can be picked up from the OS for about £30 – see here. Again, obviously bring one, but if you can bring one with a matt finish. The reason for this is that if you bring a map case without a matte finish then the light will bounce off it; making it very hard to see what is going on. If you’re just getting used to navigating at night then starting off as soon as sunsets in the middle of winter might not be the best idea. It’s going to be very dark, for a very long time, and cold and, let’s face it – probably wet. Rather, why not set off in the milder months a few hours before sunset? This will enable you to get some night time practice in but, should you get lost also mean that you only have a few hours to wait it out before daybreak. Bushcraft is about more than survival, it’s about being comfortable in nature, working with nature. Join us on a weekend course to learn natural navigation, fire lighting, shelter building and more. Navigating at night means getting your skills really up to scratch, this is the difference between thinking one can do it and knowing one can do it. We’re not going to touch on compass bearings and the like in this post (for more information on finding north, natural navigation, etc. see our blog posts here and here. What we will focus on though are some key skills navigation skills that will come in extra handy at nighttime. Aiming off is, at its most basic, using one easily findable feature as a guide to a smaller, harder to find feature. It works when the smaller feature is located along a large linear feature such as a river. Rather than taking a compass bearing from your location to a shelter and then trying to walk on that bearing until you reach it you ‘aim off’. That is you identify an easier to find linear feature, on which the river lies, say a river. You then take a compass bearing from your location to a point on the river, say 200 meters away from the shelter. You then walk on the bearing until you hit the river, knowing that when you do you have to turn, say right, then walk along it until you hit the shelter. Handrailing is very similar to aiming off. It involves navigating to a feature which is easy to follow to your intended location. 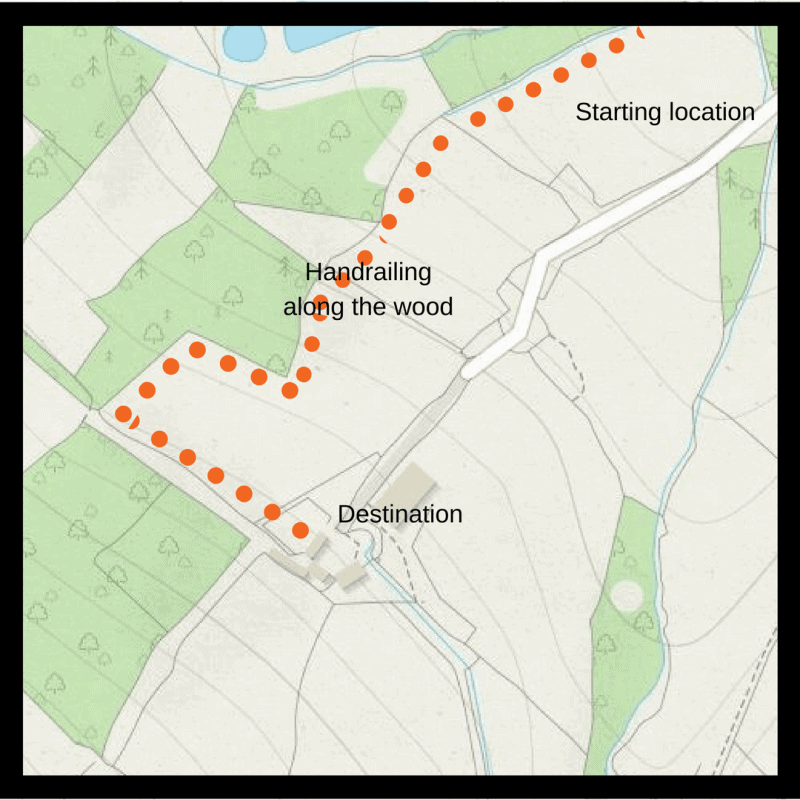 Even though handrailing might make your route longer it will, in the long run and especially at night, make navigation easier. You can handrail to handrail multiple times before you reach your intended destination. You know that the bothy is along the course of a river, prior to the river and next to your location is the edge of a forest. You use the forest as a handrail to the river, having reached the river you then use it as a handrail to the bothy. 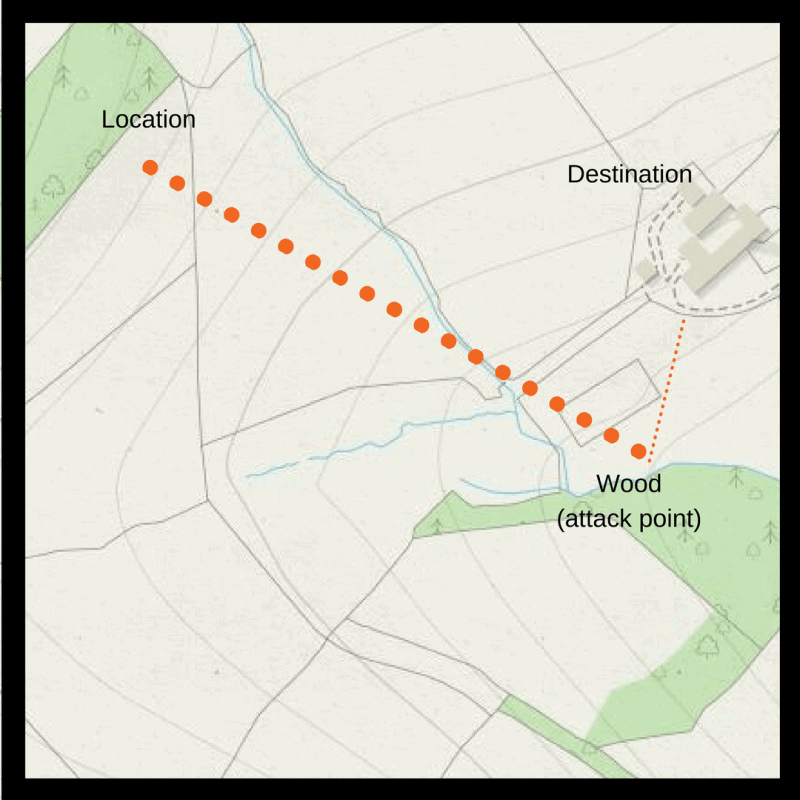 Attack points are features that are close to your intended destination but much easier to find. There can be several attack points in a navigational stretch. Attack points can also be used to lead you to handrails or prior to aiming off. Say that there is a large boulder formation next to your destination. To use this an attack point you would aim for the feature, this would then take you closer to your intended destination. In reality, you are likely to use several attack points, breaking the route up into smaller, more manageable ‘legs’. This is a particularly effective technique for night time navigation. ‘Catching’ is a technique that can, and should, be used with all of the techniques described above. A catching feature is a previously identified feature which lets you know you’ve overshot your objective. 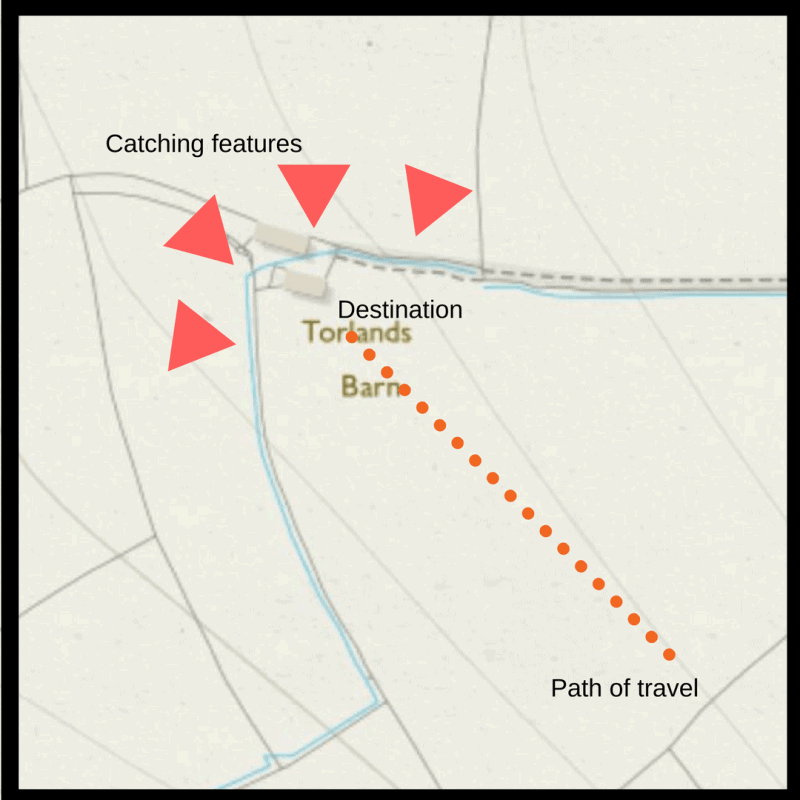 Any catching feature that you identify shouldn’t be too far from your intended destination. You identify that while aiming off the river that 50 metres past the bothy, close to the river bank are the ruins of an old house. By noting this information you know that, as you’re following the river, if you hit the ruins you’ve gone too far. Depending on your skill level catching features don’t need to be so pronounced. They can be as simple as a downward slope after a period of traveling uphill. Not a physical one as such, but a mental tick list of all the features that you should encounter on your route. Make this tick list for each leg of your route, for example, after 50 metres I should cross a small stream, 100 metres and I should be on a downward slope of about 10 degrees, 125 metres I go past the ruins of an old house, 200 metres and I hit the first attack point, or identified feature for this leg of the route. If you fail to tick off any of these features as you progress stop and orientate yourself. Dad’s Army impersonations aside, it is vitally important that you don’t panic. Panic causes one to make rushed decisions without carefully considering their actions. It is no different when navigating. If you feel that you are ‘temporarily disoriented’ then stop. Look around you and see what you can identify and how that correlates to the map (it’s very easy to make the map fit anything that you see if you’re panicked). If you do find yourself disorientated and temporarily mislaid (rarely is anyone ever truly lost) the pause. It’s always a good idea to carry a bothy shelter. These are small temporary group shelters which are very simple to use, Terra Nova do a pretty good range. Get the group inside, brew up a cup of tea and give yourself time to think about the situation. Ask, what was the last feature you passed? How far away was it? Asking yourself or the group these questions can help bring about a sense of calm and clarity to the situation. Next week we’ll be looking at foraging in the UK, what to expect and where to get started. 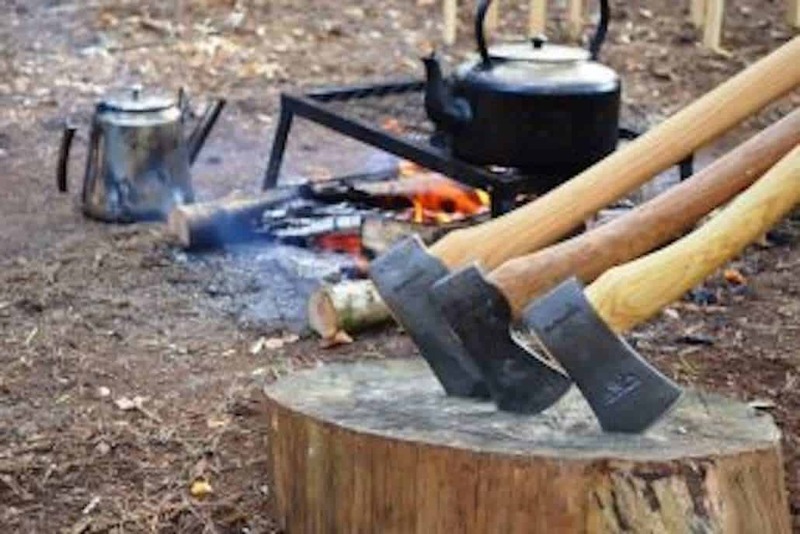 Join us for a weekend bushcraft course. Learn all about natural navigation, water sourcing, fire lighting, shelter building and much, much more.